Being in a relationship is a wonderful experience that fills you with enthusiasm and gives you a lot of happiness to be next to the one you love.There are many very special days to celebrate with your couple, such as Valentine’s Day, birthdays and of course, your dating anniversary. This is why if your dating anniversary is approaching, you should prepare a nice detail for your boyfriend in order for you both to share a nice moment and feel your love stronger than ever. To start you can give him a little surprise by sending a beautiful phrase for your anniversary, use any of ones we offer you below and post it on their wall or send it as a text message. You will see that when you send one of this cute birthday messages to your boyfriend, you will make him feel very happy and he will respond immediately. From the first time we see each other when it is between a potential partner we realize if things are going to work out or not. It is essential to identify common features in love, such as tenderness, unselfishness, trust, etc. As the relationship progresses, if displaying this type of behaviors are being displayed, then that gives us the guidelines on how things will turn out for us. If you are in a relationship where you are genuinely happy, then you should know that there are a number of tricks that you cannot miss in order to rekindle the flame of love. One secret to any successful relationship is to remember important dates for the couple and to celebrate them. They do not have to be glitzy celebrations; sometimes with a detail is enough to let him or her know how much he or she means for us. One of the dates that definitely cannot be overlooked, are birthdays and anniversaries. This time, we will concentrate on the latter. 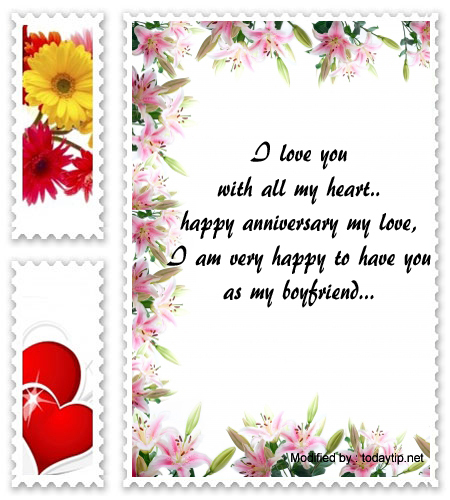 As follows, you will be able to check out many examples of beautiful phrases that we brought so you can share them with your boyfriend on your anniversary. Give them your personal touch and feel free to send them; undoubtedly, the effect they will have on the relationship will be fantastic. :: “I have waited for this day almost with a stopwatch in hand, because I could not overcome the emotion and happiness to be celebrating it with you. I have no doubt that with you life is more colorful, the aromas are sweeter and my laughter is more heartfelt. 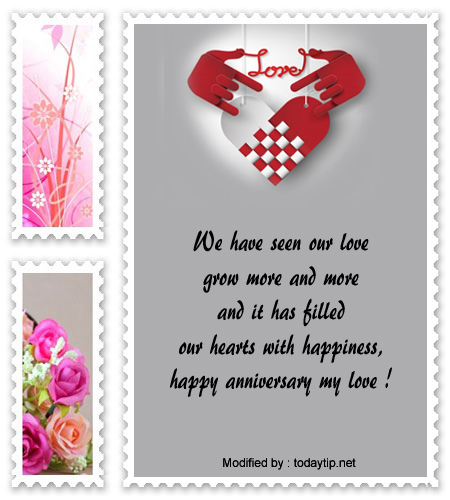 Happy anniversary, sweetheart, there is no one like you and I love you as I never thought my heart was capable of loving”. :: “The joys we share are of an unknown dimension and cannot be measured because there is no frame of reference to describe something as big as them. I adore you and I thank life because, since I am with you, it has not stopped surprising me and it has given me the nicest thing I have: the days I spend by your side. You have made me become a person who I never thought I could become, because you motivate me every day to be the best that I can be. Thank you for being so wonderful, now let us celebrate our anniversary, as we both like. I love you like you could never imagine”. :: “Some believe that good men are gone, but you are living proof that this is only the theory of those who have been unlucky in love. You make me incredibly happy and, since I go to sleep, I cannot wait to wake up because I will be by your side. 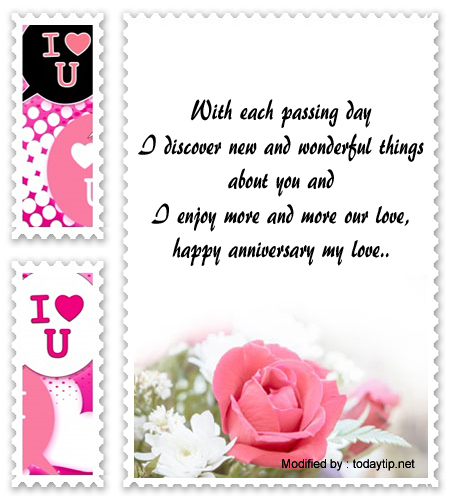 I love you and I wish you the best anniversary of all, because you deserve nothing but happiness and joy, beautiful babe”. :: “We were lost until we found each other, until our destinies finally met and we realized that, before we met, life had no sense, but an accumulation of days. We are together and I want to be like this forever, I wish you a beautiful anniversary, my life”. :: “I know how important it is for you to celebrate special dates, so I never forget any of them, because any excuse to see you smile is good enough for me to want to get off to the Moon. Happy anniversary, baby”. You will see how happy he or she will be as soon as he or she receives one of these phrases from you. Remember how cute anniversaries are, so give your partner all of the attention he or she deserves in such as special occasion. We expect to see you again very soon! If you liked this page you can help us by cliking on ” I liked it” on facebook, G+, twitter. Also if you want you can help this website by sending your originals anniversary messages for your boyfriend , and will be published, others friends will thank you . Tomorrow is our 4th love anniversary please kindly send me a lovely and romantic message for me. my boyfriend and I will have our 2 year anniversary this coming Monday. And i want to write him a letter showing and expressing my feelings towards him. good love messages ! thanks ! Tomorrow will be our fifth year anniversary, there has been up ups and downs, we’ve cried and laughed. By God’s grace we are getting married in some months time!